Are you preparing for an interview as an event planner? Event planners do precisely what the job title indicates: they manage all the logistics and planning involved in pulling off an event. These special occasions can range from weddings to conferences, from corporate conventions to casual affairs, and everything in between. Doing this job requires creativity and imagination: Event planners must brainstorm ideas for unique celebrations and memorable events, and be able to identify, understand, and meet client needs. 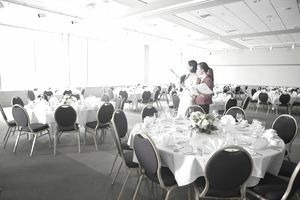 But event planners must also be intensely organized in the tracking of deadlines and schedules, making sure that all of the nitty-gritty details, such as scheduling coffee breaks at meetings and arranging transportation, are taken care of. See a full list of the skills required by special-event and wedding planners, and be sure to emphasize these skills during your interview. As you plan ahead for an event planner job interview, review the events you've already planned, thinking of examples of times you've had to think on your feet to solve an unexpected problem, deal with difficult clients, or work with a restrictive budget. As well, think about times when an event you've organized has gone flawlessly. These examples will all be helpful when answering interview questions and will give your interviewers stories to remember you by. Prepare for your interview by reviewing this list of frequently asked questions for event planners, and practice how you'd answer each question. Why do you want to work for our event planning organization? How do you assess the success of each of your events? What type of event planning are you most interested in? Corporate events? Social events? Why? Describe one or two themed events that you have orchestrated. What sort of details and activities did you include to complement the theme? What is the largest event (based on budget or number of attendees) you have ever planned or assisted with planning? Tell me about a time when you had to deal with a difficult client. What was the result? Describe a time when you had difficulty staying within the budget for an event. Tell me about a time when you had to manage multiple events at once. How did you multitask to complete both events successfully? Imagine a company is planning an ad campaign to portray itself as a young, fresh, and cool brand. If you were hired to organize their launch party, what sort of venue would you consider selecting? Why? Imagine I am a client asking you to host an event for me; what kinds of questions would you ask me? How will you develop relationships with vendors in a new city? Do you think being an independent worker or a team player is more important as an event planner? Event planning can be one of the most exciting and rewarding jobs in the hospitality industry. If you take the time to plan for your interview, this attention to detail will demonstrate to your interviewers that you possess the foresight, analytical planning skills, poise, and confidence they are seeking in their next event planner.